When he was just a kid, Robert Power discovered rugby and he looked poised to have a long career there. But fate had other plans and after a knee-injury when he was 13-years-old, he shifted towards cycling, with the Midlands Cycling Club, and this turned out to be an excellent decision. After doing the velodrome for one year, Robert finally tried some road racing and as seasons passed, he got stronger and more experienced, which helped him get some impressive results in the Juniors while racing in Europe (GC podiums in the Giro della Lunigiana and Giro di Basilicata). In 2014, as an U23 rider, he had a dominant season, during which he finished 2nd at the National Championships, a result followed by a top 10 in both the Tour d’Azerbaidjan and the Czech Cycling Tour, before going on to win three Italian one-day races, the highlight being his incredible display of power in the Gran Premio Capodarco. 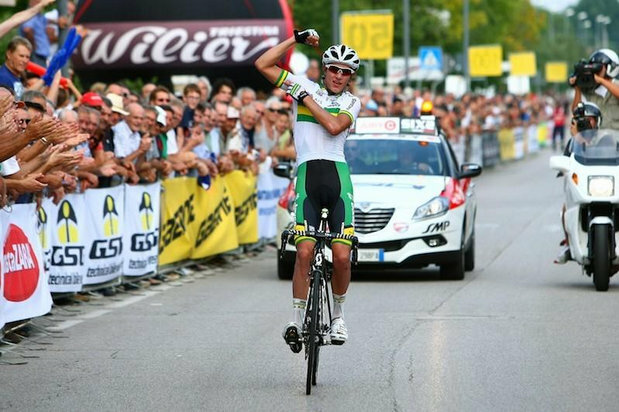 With these results in the bag, Robert Power came at the start of the Tour de l’Avenir as one of the favourites and he finished the race second, first Australian to get on the podium. His last appointment of the season was the road race at the World Championships in Ponferrada, after which the 19-year-old took a well-deserved break, before going on a two-week training camp Down Under. There he was when I got to talk to him, at the end of November. – Robert, how do you look back on your 2014 season? I think we’ve had a good year with the team, we worked really well together, and we had a really strong core, with Jack Haig, Campbell Flakemore and Caleb Ewan. We tried to get as many good results as we could and I think we did that. There was also an obvious progress and now we hope that next season we’ll have better results than in 2014. Also, I improved my abilities, as well as every little thing of what means to be a cyclist, from nutrition on how to prepare a race. – How was racing mainly in Europe? I really enjoyed it this year, it was a real challenge in my first U23 season and I liked to do longer, harder races, especially the Italian one-day races, which are terrific and very tough. There are so many good riders and so many good teams in Europe, and everyone wants to win. In Australia you have 20 guys that want to win, while in Europe there are 200 that want to do it, and this goes on day after day. Everything’s much more competitive and much more of a challenge. – Speaking of the one-day races, you’ve scored three big wins there: Briga Novarese, Poggiana and Capodarco. Which one was the most important? I have to say Capodarco, because all year I wanted to win this race and though about it. The whole team worked for me all day and I still can’t thank them enough for this, because they put everything in place. Capodarco is a really special race for me and I’m happy I won it. – Later in the season, you came second in the Tour de l’Avenir. I liked L’Avenir, is a tough race and we had a very strong team, with guys who came at the start for stage wins and guys who aimed at the GC. The team really had to work hard for the sprint stages, as well as the mountain ones. It was a completely different level there, with many national teams and I was happy to take second. Obviously, I would have liked to win L’Avenir, but we did everything we could to try and take the GC, but it just didn’t work. – In the Sun Tour and the Italian one-day races in September, you got to race against World Tour cyclists. How was that experience? It showed me what I need to improve over the years. I know I still have to learn all the little things, like positioning in the bunch or descending, all these details are really important. I have a lot of work to do in the next years, but hopefully one day I’ll be in the same league as these guys. I’ve just been on the Orica-GreenEdge training camp, not with Orica-GreenEdge, but with the World Tour Academy, so it was a really great experience to train with guys like Simon Gerrans, Simon Clarke or Luke Durbridge. It was a very good week for us. – Do you know your program for next year? I think it’s going to be similar to the races I did this year, with L’Avenir hopefully on the cards and the U23 National Championships at the start of the year. Then I hope to go to Europe again with the Australian National U23 Team and try to go for the Italian one-day races and a few more tours. Now I’m focusing on the Nationals and see where I’ll go from here. Nationals is a big race for me, I’ve been training really hard these past weeks and I’m very eager to try and get a result there. After that, Europe will come. – Did you give a thought about 2016, would you like to start the year with a World Tour team? Yes, I think I would like to become a pro then, although I really didn’t thought much about it. I’ve really enjoyed working with the GreenEdge guys in the camp over the last week and it seems that they are a really organized team and have good fun, but I want to take it easy, enjoy next season and spend another year in the U23 races.